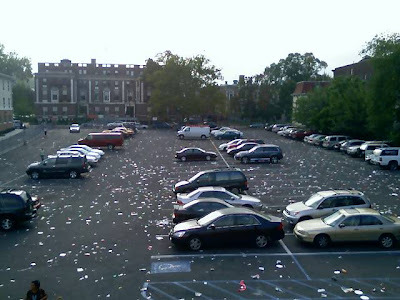 So I get to work today and discover that my parking lot has been turned into a garbage dump. 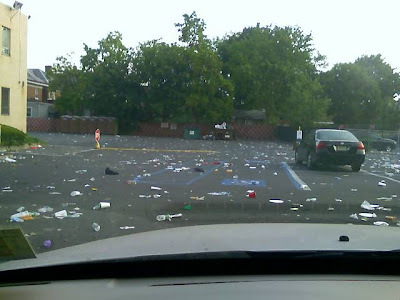 There was some sort of festival held here over the weekend and apparently no one cleaned up when it was finished. One would think that some kind of plan would have been in place for tidying up afterward but I guess not. We're placing bets on how long it's going to stay this way before it gets cleaned up. 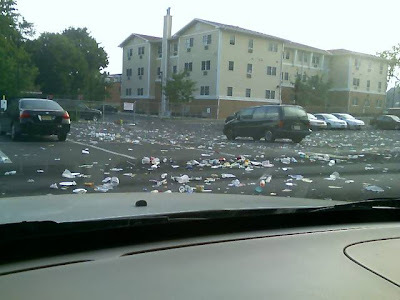 Update: The story is that the festival organizers FORGOT to arrange for strategically placed garbage cans. Pretty big thing to forget, huh? I don't think I'll be calling them to plan my next party.